Globe Telecom has announced that it will offer the most advanced iPhones ever, iPhone Xs and iPhone Xs Max. Customers will be able to pre-order iPhone Xs and iPhone Xs Max beginning October 19, 2018 at the Globe website, and will be available in Globe Stores starting October 26, 2018.
iPhone Xs and iPhone Xs Max are the most advanced iPhones ever, taking the vision for the future of the smartphone to a new level, featuring stunning 5.8-inch and 6.5-inch Super Retina displays that offer remarkable brightness and true blacks while showing 60 percent greater dynamic range in HDR photos. iPhone Xs and iPhone Xs Max offer an improved dual camera system that offers breakthrough photo and video features, A12 Bionic chip with next-generation Neural Engine, faster Face ID, wider stereo sound, longer battery life, splash and water resistance,* the most durable glass ever in a smartphone, a beautiful new gold finish that joins silver and space gray, and introduce Gigabit-class LTE for even faster download speeds. ** iPhone Xs Max offers a more immersive experience with over 3 million pixels for videos, movies and games, offering the largest display ever in an iPhone. The new iPhone Xs series powered by Globe Postpaid ThePLAN work seamlessly together to empower you to create big, bold moves and move closer to your dreams. Bring home your iPhone Xs for only P3,499 (ThePLAN 1799 + P1,700 monthly cashout) or iPhone Xs Max for only P3,799 (ThePLAN 1799 + P2,000 monthly cashout)! Sharing your creations to the rest of the world just got much easier with the record-breaking 512GB memory capacity and new A12 Bionic chipset of iPhone Xs plus ThePLAN's 11GB data. Unwind and enjoy premium entertainment on iPhone Xs Max's 6.5-inch OLED display - the largest display ever on an iPhone - with free 6-month subscriptions to Amazon Prime Video and DisneyLife. 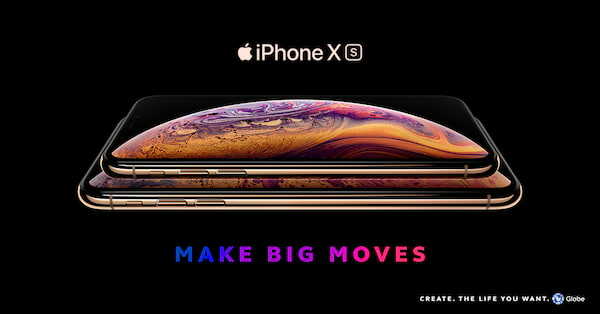 Make big moves and create the life you want with iPhone Xs Max! Choose the best data plan from Globe ThePLAN or ThePLATINUM Plan to maximize your new phone’s latest features. For more details on ThePLAN offerings for iPhone Xs and Xs Max, visit globe.com.ph/iphonexs. Don’t forget to follow Globe on Facebookand Twitter. For more details on iPhone, visit apple.com.